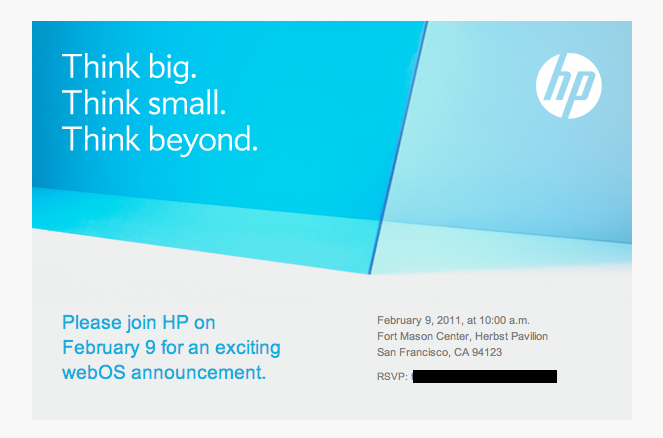 We’ve just been invited to an HP event on February 9 in San Francisco. The topic? webOS, according to the invitation. The invite’s main header reads: “Think big. Think small. Think beyond.” Could this mean an expansion of webOS to many types of devices? At the very least, we should get the skinny on the full webOS 2.0 release, which is only available in a very limited way thus far. The timing is interesting since webOS originally launched at CES ’09. That conference starts today and ends a month before HP’s event, I guess HP will be using their muscle to do things a bit differently than Palm did. But that timing also means that HP will be facing even more competition from devices just launched at the Vegas convention, many of which will be powered by the rival Android platform. We’ll be there to find out more on February 9.